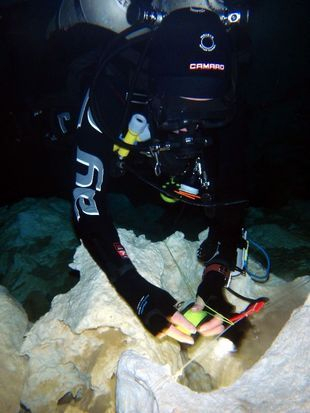 Intro to Cave Diver Course with Dive Cenotes Mexico, Playa del Carmen, Mexico. The Introduction to Cave Diver Course is the second step towards the Full Cave Diver certification. This course develops a valuable foundation of cave diving skills. It is at this point that the diver first departs the daylight zone of the cave overhead environment. The objective of this course is to refine the basic overhead skills introduced at the Cavern level, perform various emergency procedures within the cave zone, and begin to develop the awareness necessary to safe and enjoyable cave diving. Students at this level are limited to main line penetration only—no jumps, gaps, traverses or circuits are allowed. The Intro to Cave Diver course requires a minimum of 2 to 3 full days. Additional equipment required for this level of training include a seven-foot primary regulator hose, two first and second stage regulator systems, primary dive light with two backup lights, primary reel, line cutter and line markers (please review the equipment section for further discussion of dive gear with your instructor). The course is performed with double tanks, however, in some cases, it can be done with a single tank rig with adequate modifications. Please contact us if you would like to receive more information about the Intro to Cave Diver Course or to make a reservation.